In one of my earlier posts, I already briefly explained what load balancing in Exchange 2013 looked like and how you could setup basic load balancing using a KEMP LoadMaster based on a blog post that Jaap Wesselius wrote. 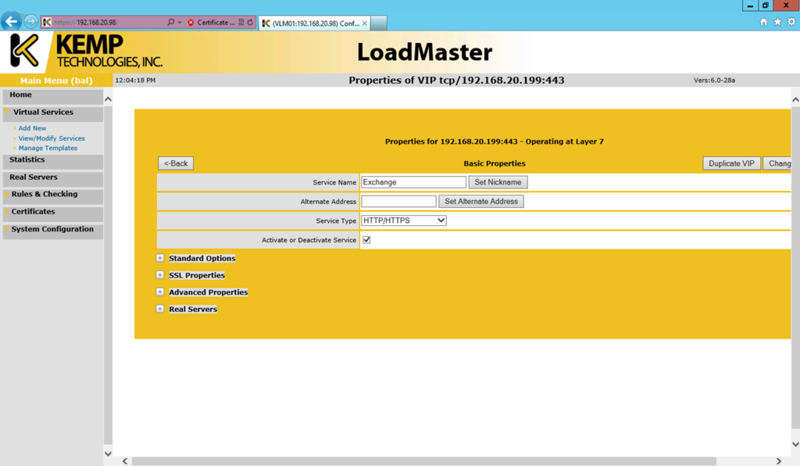 Today I will elaborate a bit more on the different load balancing options you have, along with how to configure a KEMP LoadMaster accordingly. In a future blog post (which I’m working on right now), I will be explaining how you can configure an F5 BIG-IP LTM to achieve the same results. One of the ‘biggest’ changes towards load balancing in Exchange 2013 is that you can now use simple, plain Layer 4 load balancing. More ‘complex’ and more expensive layer 7 load balancing that you had to use in Exchange 2010 is no longer a hard requirement. However, this doesn’t mean that you cannot use Layer 7 load balancing. But more about that later (part 2). In a nutshell, Layer 7 load balancing means that you can do application-aware load balancing. You achieve this by decrypting SSL traffic, which allows the load balancing device to ‘read’ the traffic that’s passing though. The Load Balancer will analyze the headers and based on the what it ‘finds’ (and how it’s configured), it will take an appropriate action (e.g. use another virtual service or use another load balancing option). Traffic decryption uses additional resources from your load balancer. The impact of the amount of users connecting through your load balancing device usually is (much) higher in such case. Also, not all load balancers offer this functionality by default. Some require you to purchase additional license (or hardware) before being able to decrypt SSL traffic. Companies might choose to re-encrypt traffic that is sent to Exchange (SSL Bridging) because of security reasons (e.g. avoid sniffing). In Exchange 2010 you could also choose not to re-encrypt traffic when sending it to Exchange. This latter process is called SSL Offloading and required some additional configuration in Exchange. Not re-encrypting traffic (SSL Offloading) saves some resources on your load balancing device, but know that – for now – it is not supported for Exchange 2013; you are required to re-encrypt traffic when using Layer 7 load balancing! So make sure that you size your hardware load balancers accordingly. How to size your load balancer depends of the model and make. Contact the manufacturer for more information and guidance. This is the most basic (and restricted) but also the easiest way of setting up load balancing for Exchange 2013. A single namespace will be used to load balance all traffic for the different Exchange workloads (OWA, EAC, ActiveSync, EWS, …). User A connects to externalurl.domain.com and opens up OWA. At the same time, his mobile device syncs (using ActiveSync) over the same URL while his Outlook is connected (Outlook Anywhere), you’ve guessed it right, over the same external URL. In this example, the virtual service is configured to check the OWA Virtual Directory (HTTP 200 OK) to determine whether a server is available or not. Now, imagine that OWA works fine, but the RPC/HTTP components is experiencing some difficulties…At this point, OWA would still return a positive health check status and the load balancer would assume the server is still healthy. As a result traffic is still being sent to the server, including traffic for the failed RPC/HTTP components. This will definitely impact a user’s experience. As you can see, it’s perhaps not the best possible experience for the end user (in all cases), but it definitely is the easiest and most cost-effective way to setup load balancing for Exchange 2013. Because you don’t need advanced functionality from the load balancer, you will probably be able to fit more traffic through the load balancer before hitting it’s limits. Alternatively, if you don’t have a load balancer yet, it could allow you to buy a smaller scaled model to achieve the “same” results as with L7 load balancing. Note to keep things brief and to the point, I’m not going to discuss how to setup a KEMP LoadMaster in your environment and what options you have there (e.g. single-arm setup, …). We’ll only discuss how to setup the virtual services and other related configuration settings. I can imagine that you’re now like “Wait a minute, does that mean that every new connection possibly end up with another server in the array?” The answer is: yes. But that actually doesn’t matter. Every connection that is made is automatically re-authenticated. As a result, the fact that every new connection is forwarded to another server (even mid-session) doesn’t impact the end user’s experience. If you’d like to know a bit more about this, I suggest you listen to episode 12 of “The UC Architects”. In this episode, Greg Taylor (Microsoft) explains how that actually works. Note if you click Add HTTP Redirector the KEMP LoadMaster will automatically create a Virtual Service for the same VIP on TCP port 80 that will redirect traffic to the Virtual Service on TCP port 443. This way you can enforce SSL and you don’t necessarily have to do that elsewhere. All that’s left now is to configure the servers to direct traffic to. 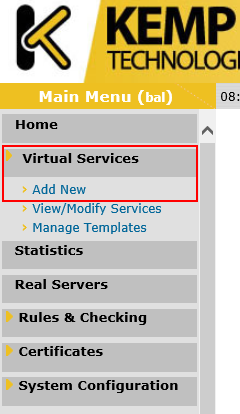 Click Add New under Real Servers to add an Exchange 2013 server. Once you’ve filled in the details, click Add this Real Server. Repeat this step for all Exchange 2013 Client Access Servers you want to add. 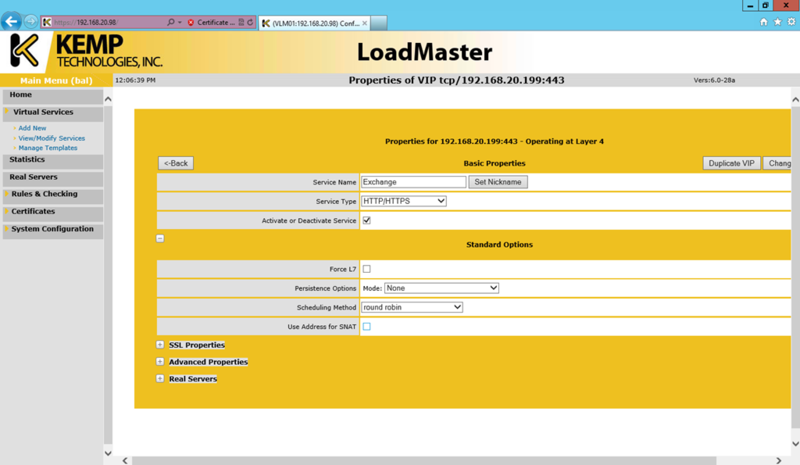 We still have to configure how the LoadMaster will check the health of the servers in the array. There are different ways to do this. In the example below, the LoadMaster will query the OWA Virtual Directory and if it gets a response, the server will be deemed healthy. Alternatively, you could also opt not to specify an URL. Do not forget to click Set Check Port after entering the port number. Believe it or not, but that’s it. 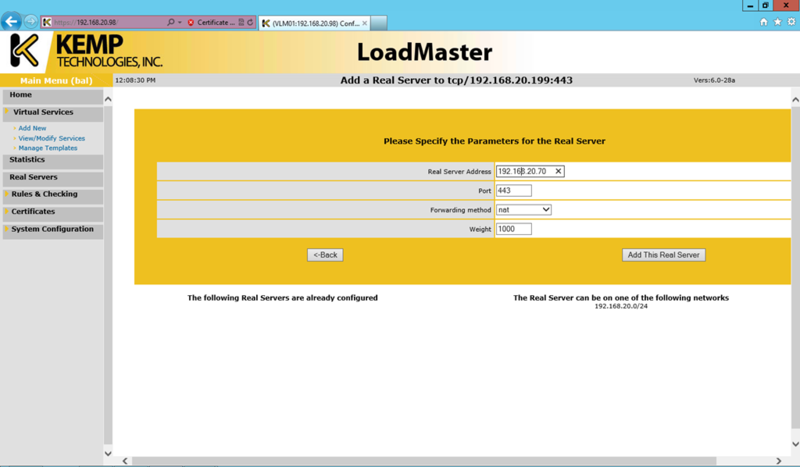 Your LoadMaster is now setup to handle incoming traffic and distribute the load evenly over the configured servers. Simple Layer 4 load balancing clearly has its benefits towards simplicity and cost (you usually need less performing hardware load balancers to achieve the same result as with L7). On the other hand, the limited options towards health checking could potentially take offline a server based on problems with a single workload while other workloads might still work fine on that server. In the second part of this article, we’ll dive deeper into the option of using Layer 4 load balancing with multiple namespaces and how that compares to using Layer 7 load balancing, so stay tuned! ← KEMP to announce “Edge Security Gateway” security features soon! This is a great post Michael! Thanks, and awaiting for the next parts. I expect to finish the next part within the next 2 days. Would have been great to see your F5 write-up for L4 with separate namespaces. You indicated you were working on an F5 equivalent but I can’t find it on your site.